This article is about the Old Town neighborhood of San Diego. 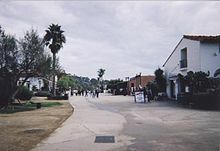 For the California state historic park, see Old Town San Diego State Historic Park. For the Old Town transit center, see Old Town Transit Center (MTS Transit Center). Old Town is a neighborhood of San Diego, California. It contains 230 acres (93 ha) and is bounded by Interstate 8 on the north, Interstate 5 on the west, Mission Hills on the east and Bankers Hill on the south. It is the oldest settled area in San Diego and is the site of the first European settlement in present-day California. It contains Old Town San Diego State Historic Park and Presidio Park, both of which are listed on the National Register of Historic Places. The Old Town Community Planning Committee advises the city on land use and other issues. The Old Town San Diego Chamber of Commerce promotes business interests and tourism. Local service organizations include a Kiwanis club. ^ "Old Town San Diego's Dia de los Muertos". sddayofthedead.org. Retrieved 16 June 2014. ^ "Home page". Boosters of Old Town San Diego. Retrieved 16 June 2014. ^ "Home page". Save Our Heritage Organisation. Retrieved 16 June 2014. 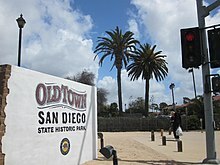 Wikimedia Commons has media related to Old Town, San Diego.